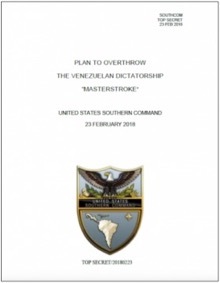 Voltaire Org has published an article written by journalist Stella Calloni, a highly regarded Latin journalist for her work on Operation Condor, that reveals that US Southcom has developed a plan named "Masterstroke" that sets out the steps to take to regime change President Nicolas Maduro. 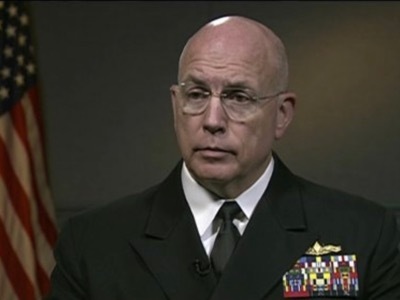 The article is accompanied by an 11 page copy of the US Southcom plan that contains the words "Top Secret" and dated 23rd February 2018. Lean on Brazil and Guyana to make use of the migratory situation that we intend to encourage in the border with Guyana. As far as the strategic perspective is concerned, it will be necessary to « silence the symbolic presence of Chavez-representative of unit and popular support » while pursuing the harassing of the dictator « as the only responsible, in the first place, for the prevaling crisis due to his inability to find the way out that the Venezuelans are in need of » as well as his closest executives, who will be blamed for the crisis and the impossibility of recovery.In another paragraph, the text calls for the intensification of « the denouncement toward Maduro’s regimem, […] high-lighting the incompetence of the mechanisms of integration created by the regimens of Cuba and Venezuela, specialy the ALBA [Bolivarian Alliance for the Peoples of Our America] and Petrocaribe ».As far as the medias are concerned, the plan drawn up by the United States calls for an increase in the broadcasting, inside the country, by local media and foreign media, of invented messages based on witness reports and publications from the country itself, making use of all means of dissemination, including the social networks, of messages « claming, though the mas media, the need to put an end to this situation because of its unsustainable essence ».In one of the last paragraphs of the document, there is mention of claiming or showing the use of violent means by the dictatorship, in order to gain international support, by using « all the capacities of the psychological war of the US ARMY ».In other words, this means setting up the same scenarios based on lies, news montages, falsified photos and videos, everything that was used during the colonial wars of the 16th century.Another question, « The United States should entirely back up the OAS, strenghtening the image of the OAS and offer multilateral institutions of the inter-American system, as instruments for the solution to regional problems. Promoting the respect of the dispatch of the UNO military force for the imposition of peace, only Nicolas Maduro’s corrupt dictatorship is defeated ».